A super walk into the upper reaches of the valley of Bollihope before a high level return via Bollihope Carrs and the heathery summit of Catterick. 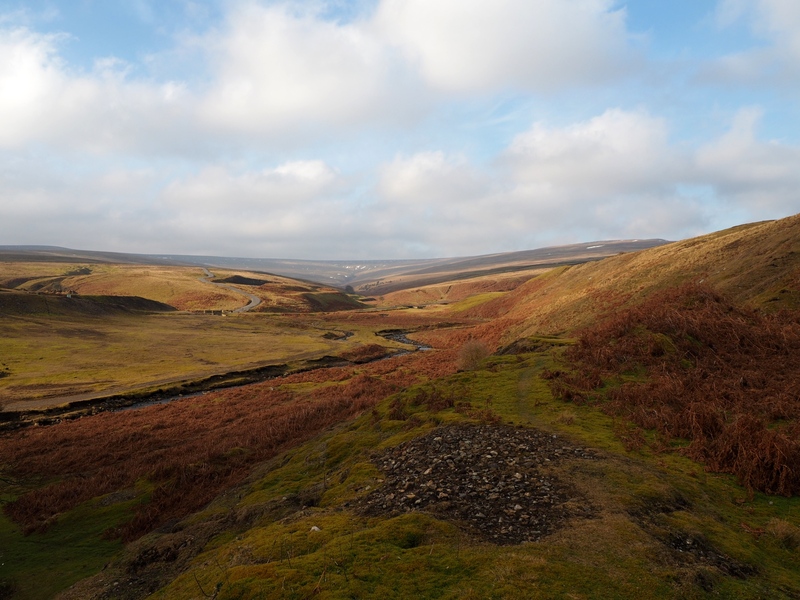 The valley of Bollihope is one of Weardale’s main side valleys. Apart from a few glimpses of it from a walk on Harnisha Hill and Five Pikes in 2015 it is not an area of the North Pennines that I’d previously seen, let alone stepped foot in. This walk then aimed to rectify that. In addition to exploring the valley I planned this route to also include a couple of trig points that I’d not visited, Bollihope Carrs and Catterick Moss. The latter trig point also happened to be on the summit of a hill, Catterick, which is one of the remaining 400m+ hills in the North Pennines that I’d not yet visited. Joining me on the walk was Paul, for our first outing together since August last year when we visited Maiden Castle in Swaledale. This latter walk can be found on my My Yorkshire Dales website. For this walk we started at the seemingly popular roadside parking area on the north side of the bridge as it crosses Bollihope Burn on the road from Teesdale to Frosterley. Right at the start a large sign warned of adders in the area. With the temperature well below freezing there wasn’t much chance of us coming across one! The initial path climbing up from the valley was virtually non-existant on the ground. At about the 280m contour we left the ‘path’ to follow a very faint trod (shown as a dotted line on the Explorer map). Climbing gradually up to the 300m mark we eventually picked up a broader track descending from an old quarry above us. This slanted soon slanted down alongside a wall and trees to reach another quarry. The day had started cloudy and quite murky but at this point the cloud began to break up. Even from the relatively low height of the quarry there was already a great view west up the Bollihope valley. Crossing Bollihope Burn at a ford we then continued on to reach the main Teesdale to Stanhope road. Turning briefly right on this we then took a track that petered out sooner than shown on the map. Climbing uphill we came to the enclosed pasture that is called Peg’s House on the map. From the north-west corner of the enclosure we took a nice grassy path heading up the valley. The next couple of miles of walking was very pleasant indeed. The main feature of note before the head of the valley was a rather random corrugated iron hut. Presumably it was set up as a small shelter for sheep. The path we were following, again marked as a dotted line on the map, continued further up the valley than shown on the map. Indeed it continued as far as the first of three waterfalls we were aiming for. The first waterfall was a fairly modest affair situated just above a small gorge like section with some trees. The next waterfall with a drop of at least 12-15ft was easily the finest of the three. Just next to this waterfall we also came across some spectacular ice formations that had formed around individual reeds and blades of grass. A few metres upstream of the third waterfall we found a small shelter that had been built into a crag. This provided a handy shelter for a lunch stop. Indeed with the sun shining down on us it felt positively balmy out of the cold wind. After lunch we left Bollihope Burn behind to strike directly uphill aiming for the rocks at Wester Stones. These proved to be a substantial rash of rocks overlooking the valley. Just above Wester Stones we picked up a path, turning right on this we headed towards our next objective – Bollihope Carrs. The path, which doesn’t quite follow the dotted line on the Explorer map, was superb. Certainly it afforded some of the easiest walking to be found over 500m in the North Pennines! To reach the trig point we had to leave the path but the going underfoot was still very comfortable. Arrival at the trig point finally brought into view the wider Weardale scene with Dry Rigg, Bolts Law, Horseshoe Hill and Collier Law all coming into view. Also notably in the view was one of Weardale’s other major satellites, the valley of Rook Hope. From the trig point a thin path headed east to a cairn perched on some rocks. Below the cairn a wider path descended in a generally north-east direction. Our next objective was Catterick and to reach this we left the path on Brackenbridge Moss to arrive just below the top of the B6278 as it crosses from Bollihope over to Weardale proper. From the road we found a very thin path that crossed the line of an old Roman road (invisibile to the eye) and gradually climbed up on to Catterick. Arriving on Catterick’s neat little summit ridge we came across some quartz prominent amongst the rocks of a modest crag. Just beyond the crag was a cairn and then, further east, a trig point which is also the highest point. Again the views were excellent, this time with the added bonus of views down the valley towards Frosterley and Wolsingham. From the top of Catterick we headed in a generally easterly direction through the heather to reach a track. Descending on this to a junction we turned left until we reached what looks like a major junction of paths. In fact the only obvious path was the one we were on so we just made a direct pathless descent to the road below. Considering that very few public rights of way were used during the walk this was much easier underfoot than anticipated. It was only really the initial ascent and descent on the non-existant path from the bridge that were a real problem. On reflection this could be avoided by starting the walk from another parking area further west on the B6278. Apart from the people visiting the quarry near to where we parked we didn’t see a single person. In other words it was a classic North Pennine wander away from the crowds.